We stock a wide range of aids and equipment designed to make life with sight loss a little easier. We are the Northamptonshire’s largest provider of services to adults and children affected by sight loss, we have a range of practical services and can offer emotional support to help you face the future with confidence. 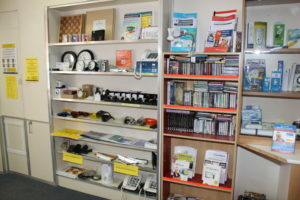 We operate three Sight Centre’s across the county from where you can buy products and find out information relating to living with a visual impairment. We offer advice, information and product demonstrations enabling you to “try before you buy”. Sadly we can’t stock everything, our friendly team are able to order in special requests from suppliers (within reason) and give you an unbiased opinion. We have two fixed locations; Kettering town centre (top of Wadcroft) and Kingsthorpe (opposite Waitrose) in Northampton. We also have a specially adapted vehicle that is our Mobile Sight Centre which travels the county parking-up at central locations for your convenience. You can just drop in to visit us – no need to book an appointment! If you visit any of our Sight Centres you will find a range of small and inexpensive solutions such as a liquid level indicator that can assist you on making a beverage, to more expensive electronic solutions such as a talking scanner for documents. All of the items we sell can greatly improve your independence and are sourced from a variety of leading suppliers. You can order over the telephone or drop-in to our Sight Centre’s to “try before you buy”. Find out more about our Northampton, Kettering and Mobile Sight Centre’s.